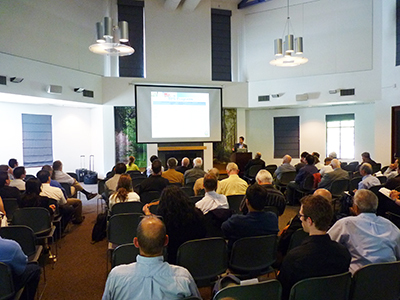 "Thanks to all of the faculty, students, researchers, sponsors, attendees and special guests who made the 2013 UC Solar Research Symposium a resounding success. And special thanks to all of our colleagues and collaborators at UC Davis and throughout the UC System." Thanks to the generosity of our Sponsors, there is no cost to attend this year’s symposium. Breakfast and lunch are included. Parking for the day is just $7. To register for the 2013 UC Solar Research Symposium, click here. Space is limited, so be sure to register early. If you encounter any difficulty registering, please contact UC Solar Administrative Analyst Robyn Lukens at rlukens@ucmerced.edu or 209-228-2988.